Completion status: this resource is ~50% complete. Correlation (co-relation) refers to the degree of relationship (or dependency) between two variables. Linear correlation refers to straight-line relationships between two variables. A correlation can range between -1 (perfect negative relationship) and +1 (perfect positive relationship), with 0 indicating no straight-line relationship. The earliest known use of correlation was in the late 19th century. The degree of linear relationship between two variables can be represented in terms of a Venn Diagram. Perfectly overlapping circles would indicate a correlation of 1, and non-overlapping circles would represent a correlation of 0. When we ask questions such as "Is X related to Y? ", "Does X predict Y? ", and "Does X account for Y"?, we are interested in measuring and better understanding the relationship between two variables. The extent of correlation between two variables, by convention, is denoted r, and the correlation between variable X and variable Y is indicated by rXY. Correlations are standardised to vary between -1 and +1, with 0 representing no relationship, -1 a perfect negative relationship, and +1 a perfect positive relationship. Bees and flowers tend to co-occur. Responses which vary can be measured as a variable (i.e., responses are distributed across a range). Responses to two or more variables may covary. These variables share some variation. When the value of one variable is high, the value of other variable tends to be high (positive correlation) or low (negative correlation). The more you look, the more you'll see that there are many predictable patterns of co-occurrence between phenomena (i.e., things tend to occur together). Independent variable (IV) (predictor) is placed on the X axis and dependent variable (DV) is placed on the Y axis. Each case is plotted according to its X and Y value. It is unwise to rely solely on correlation as a statistic that indicates the nature of the relationship between variables without also examining a visualisation of the data such as through a scatterplot. For example, the linear (straight-line) correlation in each of these four scatterplots is .82, yet the nature of what the data indicated about the relationship between the variables is very different for each. You can help expand this section. If the data are normally distributed, then scatterplots should be homoscedastistic (even spread about the line of best fit). If data are not normally distributed (e.g., skewed), then the bivariate distribution may be heteroscedastic (uneven spread about the line of best fit). This violate the assumption of homoscedasticity for correlation. For more information, see Homoscedasticity and Heteroscedasticity (Wikipedia). 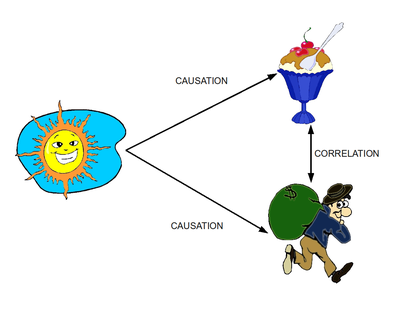 Correlation does not prove causation, although it may be consistent with causation. It is important to understand that correlation does not equal causation. A relationship between two variables may be caused by a third variable. For more info, see the effect of range restrictions (Howell, 2009) and restricted range (Lane, n. d.). For a practical tutorial, see outliers and restricted range. When a correlation coefficient (r) is squared (r2), this gives the coefficient of determination which is the percentage of variance shared between the two variables.